Kelowna condos for sale offer trendy, beautiful, and low-maintenance living options for buyers with a flair for the city life. Condominiums are often the go-to choice for couples, busy professionals, and young buyers just entering the housing market. Options for multi-family and attached living spaces in Kelowna are expanding as stunning new developments in fantastic, walkable locations are introduced to the city. Sleek, bright, and cosmopolitan, these no-fuss units allow you to enjoy the same finishes and palettes of the most in-demand single-family homes without having to worry about landscaping, routine maintenance, and driving long distances. Condos in Kelowna can be quite modern in design. Though they are scattered throughout the city, many are concentrated near downtown and close to excellent career opportunities as well as shopping, dining, and nightlife. With units ranging from simple and understated to lavish and luxurious, Kelowna's condo market is truly thriving. Explore the latest Kelowna condos for sale in the listings and contact Vantage West Realty if you have any questions. Or, you can keep on reading to find out more about Kelowna's condo market! Sign up for an account to view details for all Kelowna condo listings, receive updates on competitive units, and even save your search criteria! Kelowna condominiums for sale encompass a wide variety of units, each with its own unique appeal. There are contemporary lofts, open-concept bachelor suites, and spacious multi-bedroom units in buildings with in-house amenities such as swimming pools. Many condos feature all the same cutting-edge finishes as Kelowna's new construction homes, including hardwood floors, granite countertops, stainless steel appliances, and elegant pendant lights. Efficient condos can come in floor plans with less than 1,000 square feet, offering convenience and affordability to buyers who are often on-the-go; still, even the smallest condos in Kelowna can come with gorgeous finishes, materials, and state-of-the-art technology. In addition, compact floor plans are made to feel spacious with open layouts, clean lines, and maximization of natural light flow. 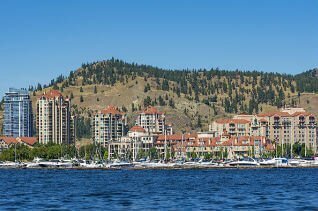 Condos in Kelowna can price for as little as the $200,000s for a small, established unit in an older complex up to more than $1.5 million for a gorgeous lakeview high-rise residence. In between these two price points, there is a wonderful assortment of units to suit buyers with different lifestyles and budgets. Some have private fitness centers and business centers, while other less expensive buildings only have residences. Some are at the heart of a bustling downtown street, walking distance to restaurants, pubs, and shops; others are tucked back in quiet suburban areas and surrounded by single-family homes. No matter which atmosphere you prefer, you'll be able to find a suitable condo in one of Kelowna's communities. Kelowna condos have major appeal for young professionals who move to the city in order to take advantage of its exciting career opportunities and sociable urban atmosphere. Living in a downtown Kelowna condo offers you all the amenities, opportunities, and excitement of big-city living combined with small city safety and friendliness. In addition, though Kelowna is becoming increasingly popular, it still offers many high-quality, affordable condos for young buyers. Small families, luxury-seeking executives, and retirees may prefer Kelowna condos slightly further from the city center. These buyers can select from elegant waterfront flats, peaceful outer-city complexes surrounded by lush green space, or townhouses which offer single-family style living without the accompanying maintenance. For condo owners in Kelowna, convenience, sophistication, and ease can be counted on. Contact Vantage West Realty to learn more about Kelowna's condo market and for expert advice on finding the right unit for you.